We just loved the wonderfully stylish main deck area with its sunken fire pit/lounge with built in seating,a heated pool and a couple of gorgeous 4-poster day beds - not to mention sensational views! Great value for money – this amount of style and luxury at this price is frankly excellent! Very easily accessible to both Durban and Johannesburg residents – just hit the N3 and you’ll be there sooner than you know it! Good chances of seeing at least 4 of the Big 5 – not to mention more kudu than you could shake a stick at! 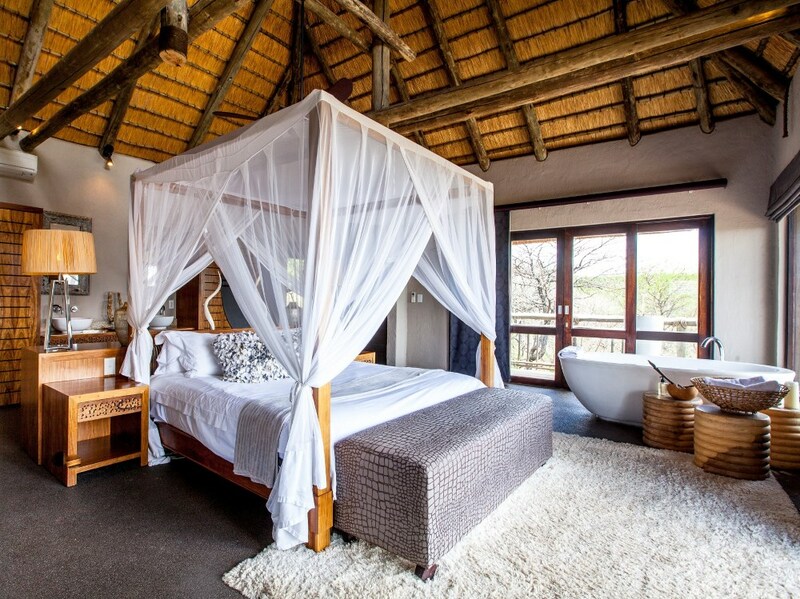 The reserve now has 10 game lodges on it, some of them renovations of the existing farm-houses, and the most exclusive of which is probably the five-star Nambiti Hills lodge. 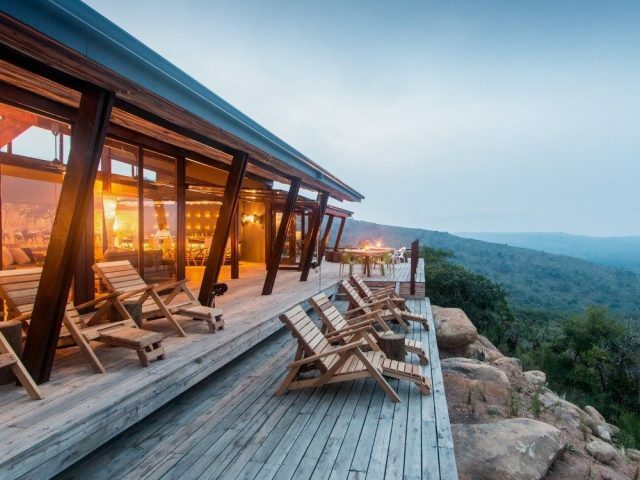 The lodge lies perched on a hilltop towards the south of the reserve from where it enjoys expansive views over the plains beyond – you can quite happily sit for hours on your private deck with a pair of binoculars and search out the game playing hide and seek in the bush below you! But perhaps the highlight of the lodge is the wonderfully chic main viewing deck area – we particularly loved the oh-so stylish 4 poster day beds where you can sprawl with a good book (obviously interrupting your reading on occasion to see if any animals have wandered into view) The deck also features a gorgeous sunken seating area around a fire pit – after dinner this is the perfect place to gather with fellow guests to chat and compare notes on the day’s happenings over a glass of red wine or a cold beer. An extended deck boasts the lodge’s swimming pool (which is also heated for your comfort!) Our daughter particularly loved the massive floating cushions in the pool which you can sprawl over whilst enjoying a refreshing drink. In the evenings you can look forward to a three-course meal of fusion food and luxurious desserts - dinner is set in the open plan dining-room which, on a hot summer’s night, may spread out onto the deck. 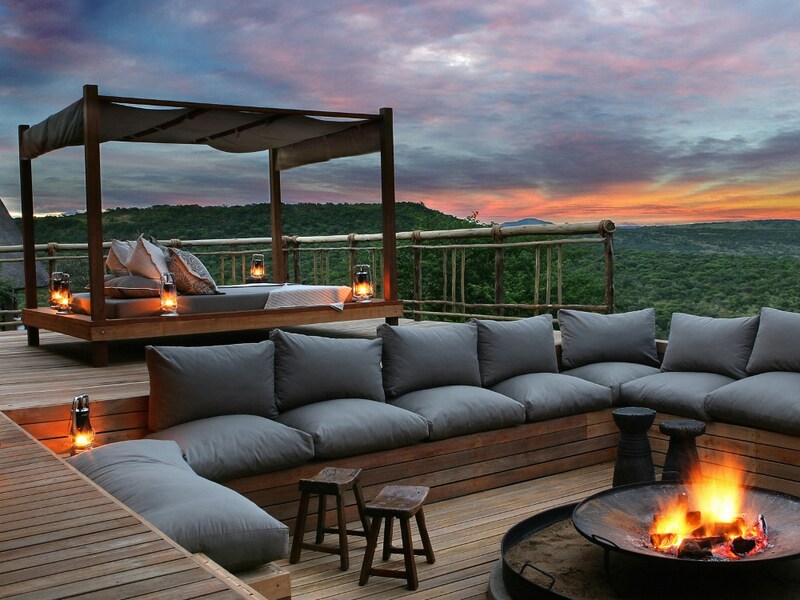 In fact you may even decide to have dinner on your private veranda of your own exclusive suite, secluded from all the other guests and overlooking the reserve. What could be better than spending time with that special person out in the wild, an inky-black sky sparkling with stars above, and a luxury king-size bed beckoning just metres away! As we said previously we enjoyed the game drive experience here more than we ever anticipated. Aside from the wonderfully scenic landscapes through which we travelled, we also saw some excellent game including 4 of the Big 5 (as is so often the case, the darned leopard proved elusive!) with the highlight probably being 10 minutes spent watching some jackal pups playing outside their den. Being in the southern section of the park, one small drawback is that your game drives generally head further north into the heart of the reserve which means that you get to see quite a lot of these connecting roads. Another minor quibble is that there are power lines visible in the “Serengeti plains” area in the far west of the reserve, obviously a legacy of previous years when this was farming land. But really these are minor quibbles and we ended up thoroughly enjoying our drives at Nambiti Hills. 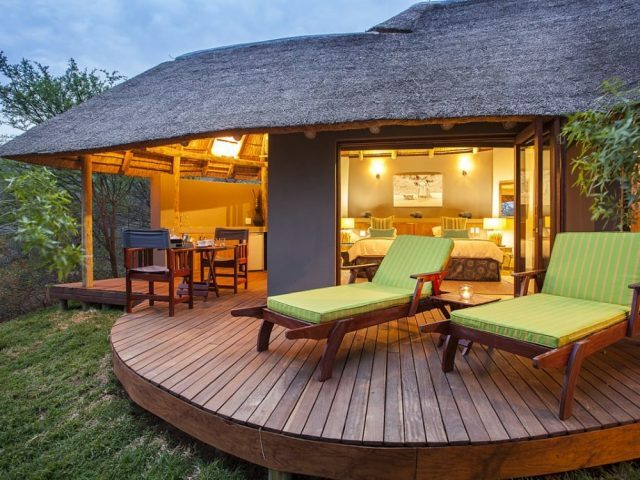 If you want an easily accessible dose of romance and the all-pervading sense of peace that only the bush can bring, then Nambiti Hills is a great option! The complete change of pace for starters; the background music of bird calls (and the odd animal’s grunts! ); the distinct smells of the bush (better than any perfume - a rather compelling combination of dust, dung and vegetation or at least, this is what I imagine the components of the smell to be!) 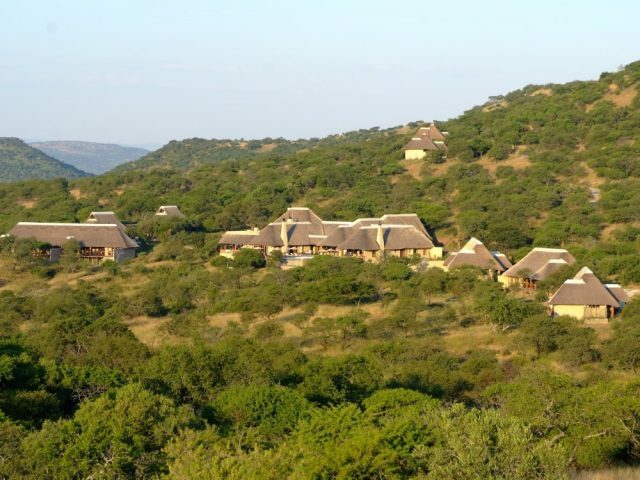 – all of this means that 2 or 3 nights at Nambiti Hills will see you return to the city refreshed, renewed and ready to take on the world again!